Gender equality and equal opportunities for women: this is the objective of the National Committee of UN Women to be reached in the shortest possible time. The 59th Session of the CSW (Commission on the Status of Women) took place last March in New York on the theme of gender inequality and the empowerment of women. During the conference, which brought together the world’s top institutional representatives, the leaders present made the decision to reaffirm the commitment taken during the 1995 Beijing conference and setting themselves an ambitious, but concrete goal: to end gender inequality by 2030. A tough, but attainable, challenge to be pursued with the Planet 50-50 Step it up for Gender Equality initiative, which has the objective of eliminating gender inequality. The main promoter of this campaign is UN Women, a United Nations Entity for Gender Equality and the Empowerment of Women, which works precisely on these themes giving voice to women across the globe and turning their every day battles into a global challenge. 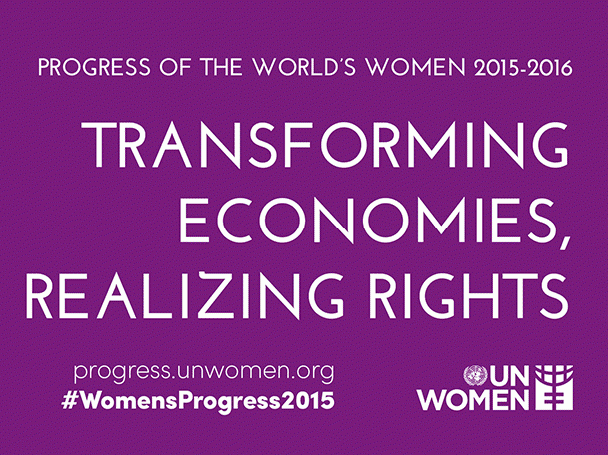 Italy is proud to be one of the 18 countries in which UN Woman is present at a national level. In fact, UN Women - Comitato Nazionale Italia has been active for years providing support to the programmes and objectives of women’s empowerment and making progress towards gender equality, placing particular attention on the social and economic empowerment of women and on the important role that they can and must have in pursuing the sustainable development of society. As highlighted by WE-Women for Expo, women are promoters of change and have a strategic role in society as a whole. In fact the theme of female empowerment also implies the recognition that women represent a central element for promoting a more sustainable and inclusive development. By empowerment we mean those processes aimed at building women’s self-esteem, the recognition of their knowledge, skills and talents, the development of their capabilities and, above all, the opportunity of making decisions, of being independent, and having a voice in matters that affect the family, society and politics, through greater access to key decisional-making realities in society, politics and the economy. A hot topic in Italy is undoubtedly the under-representation of women in managerial roles, particularly, but not exclusively, in the private sector. Despite the fact that girls achieve better results than boys in education, access to the world of employment and career advancement to managerial roles, still remains far more complex for women than for men. Nonetheless, since the economic crisis, there has been a drop in the level of female unemployment, but far less than that of men. The numbers show how employment is becoming an important aspect in the lives of Italian women. At the same time, however, women continue to be primarily employed in low-income and low-skill sectors, remaining, to date, scarcely represented in the economic decision-making sectors. In 2013 Italy was in 71st position (out of 136 countries) in terms of gender equality and 97th in terms of economic opportunities. Italian women are thus an undervalued and under-used economic resource. UN Women is committed at international and national levels, through our Committee, to promoting concrete actions that can ensure that gender equality and equal opportunities become a tangible reality in shortest possible timeframe. This commitment has been inscribed into to the WEP document (Women’s Empowerment Principles), supported by the National Committee for UN Women in Italy, and consists of 7 principles aimed at the empowerment of women and the end of gender discrimination, urging the private sector in particular to undersign the document and to concretely apply those principles to everyday management. In this context of raising awareness, but also as support to institutional policies and to the decisions made by key economic players, comes the latest initiative by UN Women: the Progress of the World’s Women 2015 2016 report, “Transforming economies, realizing rights”. Twenty years after the Beijing Conference and with the imminent launch of the Sustainable Development Goals, the need has arisen to strongly emphasise the how the market must open up to women in terms of gender equality and equal rights, but also as an eco-system that promotes the value of the contribution of women and does not consider it an element of weakness. And by issuing warnings as well as providing recommendations, this document sets out to act as an important reference point for governments, international organisations, representative bodies and the third sector with regards to the economic policy agenda for women.